Trixie Cat Activity Strategy Game Tunnel Feeder challenges your cat during mealtime while slowing her eating—which can contribute to better digestion and nutrient absorption. Simply fill the center compartment with food or treats and it will automatically disperse into different tunnels where it must be teased out. 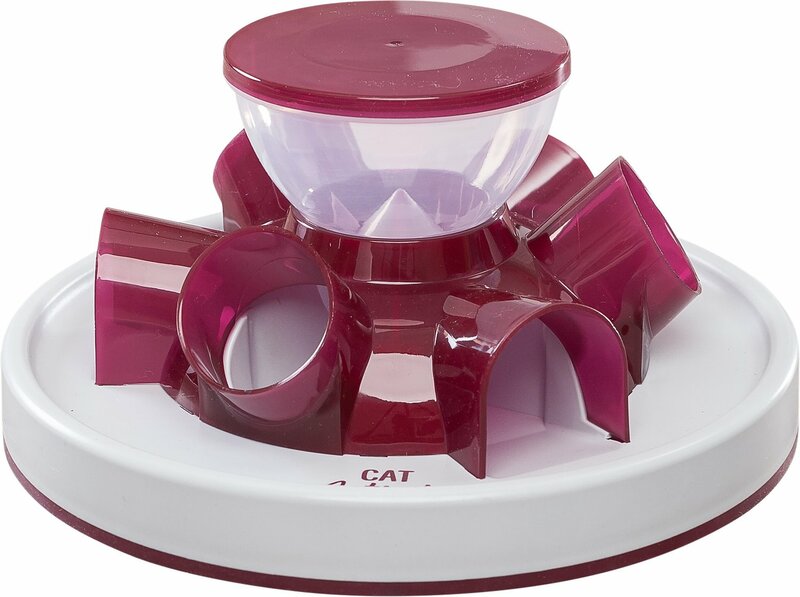 The non-slip rubber rim keeps the feeder in place as your cat eats and explores. 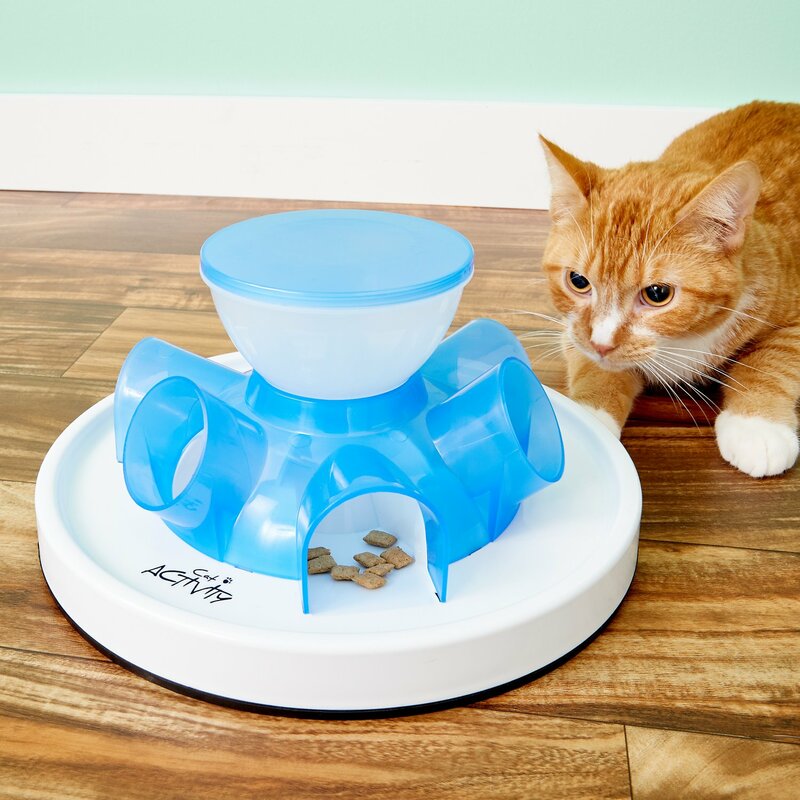 Trixie Cat Activity Strategy Game Tunnel Feeder is dishwasher safe for easy cleaning. Screw open the lid of the food compartment. Turn the adjustable pin all the way to the top. Fill the compartment completely with dry cat food. Hold the Tunnel Feeder sideways in a horizontal position. Turn the adjustable pin back downwards so far that the storage areas for the 3 tunnels and the 3 tubes are filled and no more food crumbs are trickling down. Place the Tunnel Feeder at the desired location. Refill the food storage compartment completely with food again and close the lid. The cat can now pry the food out of the tubes with its paws and feed at its own chosen pace through active exercise. Tip: Should a piece of food get jammed in the food storage compartment, twist the pin as far down as is necessary to clear the jam. For cats aged 3 months and up. I have 3 cats, so it's hard to tell if all 3 are using it regularly or not, but I have seen all of them nosing around. I use it for treats, since their food is pretty big spheres...although I might try that too. It's a nice way to arouse their curiosity and reward their nosiness. ;-) I like that they have to work at it a bit, but it's not so hard that they give up. Although our fluffy orange butterball is super insistent when it comes to a tasty treat! My cats are skinny gluttons that liked to gobble down their food. This would all too often lead to them not getting to hold onto their food very long, and my carpets being a mess. Before this product arrive I was spreading their food out like chicken feed on cake pans. 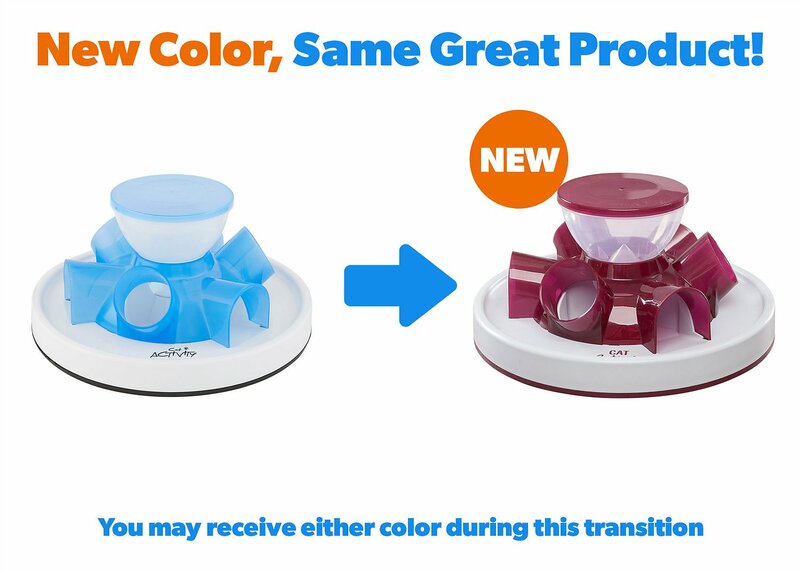 This product requires much less effort, is easy to clean, and large enough that two cats can comfortably use it to get their food at the same time. I am also happy to retire that my carpets look great and their tummies stay full. I was looking forward to using this product since I have a rescue cat who eats like he's still living on the street. I was hoping this would slow him down a bit. Unfortunately, I never got the rotating pin to work, I think it only works with small kibble. My only option is the fill the chambers individually and ignore the top container completely. It still works but it's not worth the price I paid. I bought this because my cat would eat too fast and then throw up. It took a little time for her to get used to it, but it has solved the issue. The only complaint I have is the food doesn’t always come down the tunnels even though I have it open almost the whole way. Fun for your cats...and you! The cats and humans love this feeder! The directions and video are not the best but we have made it work. (So have the cats)! Since we started using this feeder and changed the food are cats are not getting sick. I have used interactive feeders for my cats since they are lazy cats usually. I did have Catit Senses 2.0 Food Tree Cat Feeder and it lasted awhile but now i tried this new one and they love this one too. So i believe either one would be good to get a cat active in eating. Our house caters to kitties. We currently have 24 in total. And at any given time there’s 15-19 in the main areas. Because we cannot easily serve several meals a day and we free feed it was a suggestion of a vet that we buy fun aka slow feeders. After looking around on Chewy I found a good variety. I think I bought one of each. Or at least close to it. I was in and out of the house all day and this is the feeder they used the most! They took to this feeder immediately. It was easy for them to learn. The kittens especially love it. I will be buying a couple more of this particular one. As usual with Chewy I received this item promptly after purchase. The product is made from high materials, however the bowl lid is hard to screw on and off. Directions for use are confusing. And alas, my two playful and active boys found it boring, even when I used their favorite treats.